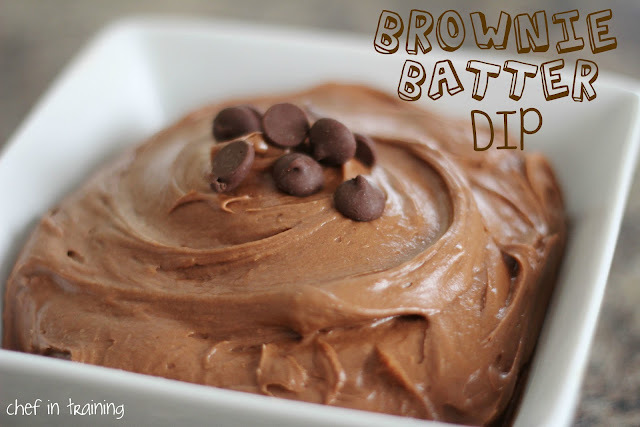 This dip is the closest thing to real brownie batter and you don’t need to worry about raw eggs… how Perfect is that?! II actually made this. I think I found the recipe on crumbs and chaos. I think it tasted more like chocolate cheesecake dip then brownies. Of course it was still super yummy. Truly-- one of the best things I've ever eaten! What would you suggest be served with the dip? Holy Fantastic! This recipe looks wonderful! I can see dipping so much into it!!! I am also curious what you dip into it? Fruit? Nuts? Cookies? I must try this. We did Graham Crackers and Vanilla Wafers. You could try out fruit like strawberries or something along those lines and also maybe pretzels. wow! looks amazing. another thing to add to the 'to-do' list! I could just dip my spoon!! OMG!!! I could just take a spoon and eat it like that. Thanks so much for the suggestions. BTW, made a few of your recipes for dinner and they've been a hit. So glad I found your blog!! Okay...so maybe I never got the memo on this but what is AP flour? Please...don't laugh!!! All purpose...I think. ;-). I didn't get it right away either. Not laughing at all! That is a great question. It is All Purpose flour. Sorry about that, I will change the recipe to clarify it better. Oh my lord. Seriously. Oh my lord. True love. We made this for a cook out and it was amazing. I hope that you don't mind, but I have pinned this on my Pinterest. Awesome recipe. Thank you! I'm def making this part of my Easter menu! Can someone tell me how many servings this makes please? Under your instructions it says to add brown sugar, but it isn't listed under the ingredients. How much brown sugar is needed? thanks for bringing it to my attention. I fixed it now :) It is 2 Tbsp. I just wanted to let you know that we have been enjoying this recipes for awhile now;) Thank you for sharing this yummy goodness! Welllllll today we needed to make cupcakes for my son's birthday & we decided to make this for the frosting;) YUMMY YUMMY goodness! I wanted a dark-colored dip to put in my jack o'lantern-carved orange for our office Halloween party, and this was just the thing! I'm surprised by how much like real brownie batter it actually tastes. I was expecting more of a cheesecake or cream cheese frosting flavor, but no, it really tastes like unbaked brownies! I took strawberries and pretzel sticks for dipping, but here at home I've been dipping Oreos, which are even better. Making this AGAIN today... We LOOOOOVE it!